DarkeJournal.com: Edison State Works Officially In The Works? Edison State Works Officially In The Works? Edison State President, Dr. Doreen Larson cuts the ribbon to Edison State Works with support from regional officials and college trustees. 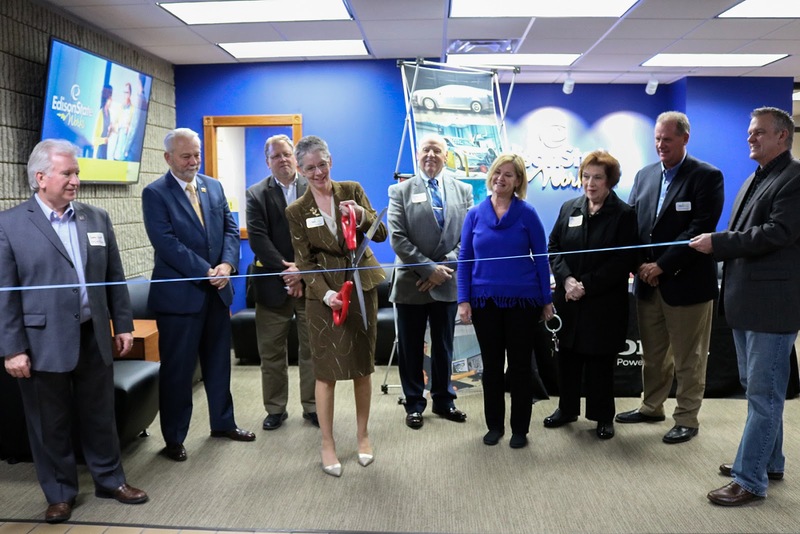 "There are many great things to come for Edison State and our community," said Edison State President Dr. Doreen Larson just moments before cutting the official ribbon to launch Edison State Works. Community members and leaders, government officials, students and alumni, staff, and industry leaders came together Thursday evening to witness the unveiling of Edison State Community College's latest initiative, Edison State Works. "It is so great opening up this space and imagining what it will evolve into," said President Larson. "This is a space that is unique in concept, in that, it is dedicated to our community and business and industry partners." Edison State Works is a workforce development and education initiative intended to connect Edison State students and staff, regional employers, and communities with an opportunity for growth. The slogan, "generating the next workforce," further supports this idea. "We were very intentional about this initiative and naming it Edison State Works," added Larson. "You don't hear the word work as much as you used to. You hear words like easy and fast, but Edison State is a place where students come to work. And the work that they put in the classroom translates to the quality of work they put back into the community." The designated area will serve as a place for regional businesses and organizations to connect with Edison State students, faculty and staff to raise awareness, build and strengthen relationships, and further develop workforce opportunities. "We invite our industry partners to come in as much as they need to engage with our students and faculty," added Larson. "We are confident that once employers engage with our students and faculty, they will understand the quality of education and quality of our graduates." "In our region, there is a lot of great talent and opportunity, and we want to help keep that great talent here." True to Edison State's branding, the area is painted vibrant blue and has updated displays, furniture, and flooring. "It is professional, high-end, and, most importantly, accessible," added Larson. "We have space for presentations, there is a private area available to meet one-on-one with students or faculty, and this space is open to evolve into what is needed." For more information or to schedule a visit, contact the Center for Workforce Development and Education by calling 937-778-7811.